A basic cobbler dough, which is like a drop biscuit, should be mixed with a light hand so it will rise up through the berry mixture and have a light texture. Mix just until the dry ingredients are moistened. Add 3/4 teaspoon of a blend of warm baking spices—cinnamon, ginger, nutmeg, or cardamom—to the cobbler dry ingredients to add an aromatic edge. And a small spoonful of pure vanilla stirred into the berries will enhance their natural sweetness and allow you to reduce the amount of sugar used if you’d like. A mash-up of summer berries can take a basic cobbler beyond an everyday dessert. Mix up your own favorite combo of blackberries, raspberries, blueberries, even garden currants or wild Marion or boysenberries. Tossing blackberries and blueberries together with some honey is both beautiful and delicious. Try them spooned over the basic cobbler dough, topped with a generous sprinkle of granulated sugar mixed with grated lime zest before baking. Some food historians say that the term “cobbler” came from Westward-heading Americans who “cobbled” together this fruit dessert in Dutch ovens and cooked it over open campfires. Another story says it was named for the way the baked dough on the top of the dessert looks just like a cobblestone street. 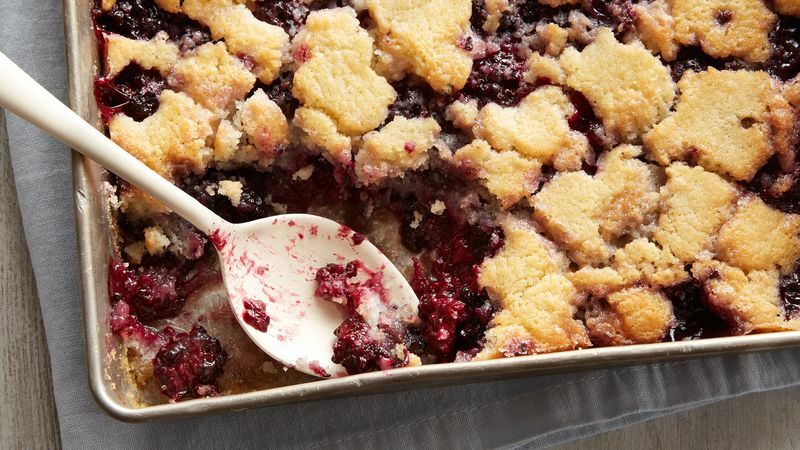 No matter the origins of its name there’s no denying that blackberry cobbler is a delicious dessert. Cobbler has been a home cook favorite for so long that variations of the dish (see Betty's Best Blackberry Crisp and Cobbler Recipes to see our top picks!) are known by a number of different names all across the country, including grunts, pandowdy and slumps in New England, or the whimsically named sonker, a deep-dish cobbler found in North Carolina.